He has a white beard and Peyos. That means nothing. He has accusations that he “fiddled” with women in Israel. That means something. He exclaimed that if the Moshiach didn’t come on Tu Bishvat, then everyone would know he is a charlatan. Moshiach didn’t come. He is a charlatan. It is a small step, it seems for a charlatan to oversee a dangerous cult that now issues death threats against South Africa’s Chief Rabbi. In South Africa, don’t hold your breath waiting for him to be arrested and exported to Israel. This is a dangerous man. Whether he is a Rabbi or not, I do not know. Whether he is a Rabbi who deserves that title, I do know. He does not. He is contemptuous and should be deported to face charges. The Mossad have a long arm in saving Jews. The South African Government is anti-Semitic because they erroneously think that the Bedouins in Yehuda and Shomron somehow constitute a latter day indigenous nation. That Government is itself unable to create an environment of law and order, and it preaches to Jews. The Mossad should pick up Berland and bring him to justice. Eliezer Berland should be put in chains and dragged back to Israel to face a court of law. His brand of pseudo chassidism is nothing more than a perverse fiction. Don’t hold your breath for the socialist Pope to call for Berland’s arrest. The Pope has a global swag of perverted pedophiles under his purvey. Berland argued that he shouldn’t be returned to Israel because he is from the West Bank. Heck, South Africa supports the BDS so why don’t they return him unopened to Israel as illegal produce? The article, written by Mishpacha Magazine deputy editor Aryeh Ehrlich, explained how the haredi community refrains from going up to the Temple Mount since the haredi rabbinic leadership prohibits visiting the site. Almost all leading haredi rabbis and arbiters of Jewish law rule that Jews may not visit the Temple Mount since they may enter areas that are forbidden to enter without undergoing purification rituals which cannot be conducted today. In the rest of the article, the Mishpacha deputy editor observed that several victims of the recent spate of terror attacks have been from the haredi community, and wrote that he was trying to understand why this was the case. He went on to detail a conversation he had with an Arab worker at a Rami Levi store and he tried to convince him that members of the haredi public do not go up to the Temple Mount. Ehrlich was subjected to fierce condemnation on social media once awareness of the article spread. “The Mishpacha newspaper is turning to murderers to ask them not to murder haredim…everyone else is okay apparently. (He forgot that the pogrom in 1929 was because Jews went to visit the Western Wall),” tweeted far-right former MK Michael Ben-Ari. Following the outrage prompted by his article, Ehrlich took to Twitter and said that he was trying to explain in his article that the Islamic Movement in Israel was trying to create a religious war and has urged Palestinians to attack people with a religious appearance. It is beyond belief that these morons from Mishpacha think they can affect anything. As if the Arabs don’t know this. They know it’s a beat up. They dress up as Haredim wanting a lift so that someone will stop and give them a lift, and then pull a knife on the Jew loving driver who thought he was picking up a harmless Haredi. It’s become a horribly repetitive and deflating refrain. Children abused, abused unfairly treated and often ostracised, all sorts of Askonim and Rabonim are accused and shown to have done the wrong thing. Papers such as the AJN have a field day. Some get away with it, others are punished accordingly. Psychologically, the Chillul Hashem is all too heavy to carry at the minute. I feel embarrassed to be a Jew in רשות הרבים when it’s pasted all over the Sun and AJN. One thing though: if anyone even remotely tries to pressure the courageous girl who came forward and lifted the lid on probably the most closed community in Melbourne, they should be sent לעזאזל with due legislated gusto. I’m not taking comments on this post. The matter is before the courts and will be decided appropriately. Someone tell me Charedi Shules are also involved? in partnership with Australian Childhood Foundation. This vital project will prioritise the rights of children to protection from abuse by employees and volunteers in member shules across the state. Working closely with the Australian Childhood Foundation, each participating shule will formulate an effective child protection policy and system to cover all of its programs and activities. .
•responding effectively to situations in which a child is abused or exploited by an individual involved in the management or delivery of a service or activity. Dr Joe Tucci, CEO of the Australian Childhood Foundation applauded the RCV for taking this initiative. “It is an important commitment by any organisation to become accredited under the Safeguarding Children Program. It will help everyone involved in shules to understand their responsibilities to protect children and keep them safe”. Dr Tucci said that “Safeguarding Children accreditation will demonstrate that each shule has achieved and maintained best practice standards for protecting children and young people from abuse and exploitation whilst they participate in the shule’s services and programs”. Throughout 2015 the shules will be attending monthly Safeguarding Children Workshops in order to develop their policies and procedures in line with the seven standards. The inaugural workshop was held this week. Author pitputimPosted on March 18, 2015 March 18, 2015 Categories Abuse, Agudas Yisrael, Education, Litvaks, Mesira, Neturei Karta, SatmerTags Adass, charedi disestablishmentariasm, Heichal HaTorah, the torah centre25 Comments on Someone tell me Charedi Shules are also involved? I had previously written that I was so upset by the thing that I couldn’t bring myself to watch proceedings. Yesterday, towards the end of the day, for some reason I can’t explain, I decided to see what was happening, and caught about an hour of Yossi Feldman’s testimony. Some aspects of that testimony made me feel ill, quite literally. It disturbed my sleep last night significantly and I awoke in a nightmarish state imagining I had spent the night in the Royal Commission watching proceedings. I missed Shacharis because I was affected by what I had heard and seen in that one hour and woke in an agitated state. Many things struck me, but one was reverberating in my head as I drove in to work. When asked whether he had undertaken any specialised education since the issue became headlines, Yossi Feldman admitted had not but intended to do so in the near future. I could not understand why one, who by his own admission, had at best a very immature understanding of sexual crime involving minors (and I note that his answer of 13 years of age (Bar Mitzvah) was disingenuous even from a Jewish point of view because one is not a Bar Onshin (punishable) until they are 20 thereby making a person a “minor” in respect of punishment until they are 20 according to Jewish Law) had not undertaken any formal education in this area himself immediately. I recognise some live cloistered lives, but it is precisely those people who need that type of education more so than those who live in the real world. The world is a much crueller place than some imagine. We have been following the Royal Commission into Child Abuse with concern as we hear the awful experiences people have gone through. in seeking therapeutic assistance or for whatever else they require. policies in place to attend the JCCV training sessions, or similar appropriate ones. Child abuse is heinous and unacceptable. The responsibility lies with all of us as a community and society to ensure we take action to prevent it. Jewish Taskforce Against Family Violence Inc.
and it dawned on me that perhaps there is no chapter of this organisation in New South Wales? If this is indeed the case, there is a strong argument simply based on one hour of what I watched, that all in positions where they educate the young or interact with the young etc undertake a series of courses as described by the Jewish Taskforce and often offered by them. Certainly, I would make it compulsory as part of Rabbinic Studies designed for communal leadership. If there is no such organisation in Sydney, then it’s time some from NSW came down and followed the processes used here to make such facilities available. It would be silly to assume that this problem only existed and will continue to manifest itself solely in Victoria and NSW. These types of education programs should be compulsory in every state, even those with fewer students. I extend this call to Bar/Bat Mitzvah teachers, those who give Shiurim in a Kollel or house of learning, and anyone in a position where they interact in a way that may be amenable to grooming or whether there is a power differential. Knowledge is power. People need to know and understand. Clearly some do not. Never assume that you are “anonymous” on the internet. You can go through hoola hoops to hide your identity if you know your stuff, but 99.9% of people don’t know how to do this. Is it worth it? The only time I can think of someone wanting to post an anonymous comment is if they have something that is so important to tell but simply are unable to reveal their name. This is an exception. It should happen in very few cases. One example might be a real victim of crime. Even in that situation, you would hope that the person doesn’t just use the internet, but actually goes to the police and makes a formal complaint. If they cannot bring themselves to make a formal complaint, then depending on the nature of what they have written, we make a value judgement call on whether it is reasonable that they remain anonymous in the context. There are far too many weasels, sock-puppets, and malingerers on the net who make “anonymous” comments which are demonstratively false and hurtful. That’s not what anonymity is about. That’s just offensive cowardice. Some websites are simply magnets for these toilet-like comments: Scott Rosenberg’s blog is one example where there is much horrible comment and back stabbing. Sometimes, it is unfair. There is no effective right of reply because of smoke and daggers and innuendo. When we say things, just like in our daily speech, we need to be careful that there is a positive purpose in what we say or write, and that we are very sure about the veracity of our statement. When I started blogging, it was for my benefit, so to speak. I enjoyed and enjoy the opportunity to express what’s on my mind, or something I have learned. In doing so, I have been (or tried to be) very conscious of not allowing ad hominem attacks via comments, and have edited and rejected comments accordingly. I don’t force people to login to show their identity; they could use a fake email, but anyone who thinks that authorities can’t trace them, should think again. I know a little about these things as a computer scientist. That being said, I’ve only once wanted to find out someone’s identity, and that’s when that person made threats to my family through this blog. In the end, I let it go. If it would have occurred more than once, that person may have found me on their door step, with an officer in tow. It comes then, as little surprise that the “anonymous” blogger “ifyoutickleus” who has been trying to out R’ Chaim Halpern of London, is now under attack. R’ Halpern’s supporters have applied to find out “who he or she is” via google (who host that blog). This is not new. We have such cases in Australia as well. It will be an interesting unfolding episode. If R’ Halpern is found guilty of an infraction of Jewish Law, then as I understand it, the anonymous blogger may not be found guilty of defamation? But who will determine if R’ Halpern allegedly did what he is purported to have done (which I understand may not be against Secular Law)? Will it involve the courts summoning the new Beis Din that has been formed to judge this case, and about which I understand very few women trusted enough to come forward? Will they subpoena the Rabbis who have publicly called on R’ Halpern to resign? This is going to get very messy, and I think R’ Halpern’s advisors have made a poor call. They may end up knowing who is publicising the material “anonymously” if google cough up the information, but that won’t cleanse R’ Halpern, surely, except in the eyes of one-eyed supporters. One needs to look at these issues with both eyes. If R’ Halpern has nothing to answer for, so be it. If, on the other hand, some allegations are true, then he should do the honourable thing, and step aside. The mere fact that there was already an exposé on Channel 4, in which R’ Padwa did not emerge in a very good light as far as the issue of Mesira is concerned, would tend to suggest that this new subpoena will only cause a brighter torch to shine on the Charedi community in London, and Jews as a whole. Not good. It is true that R’ Halpern has a right to defend himself. 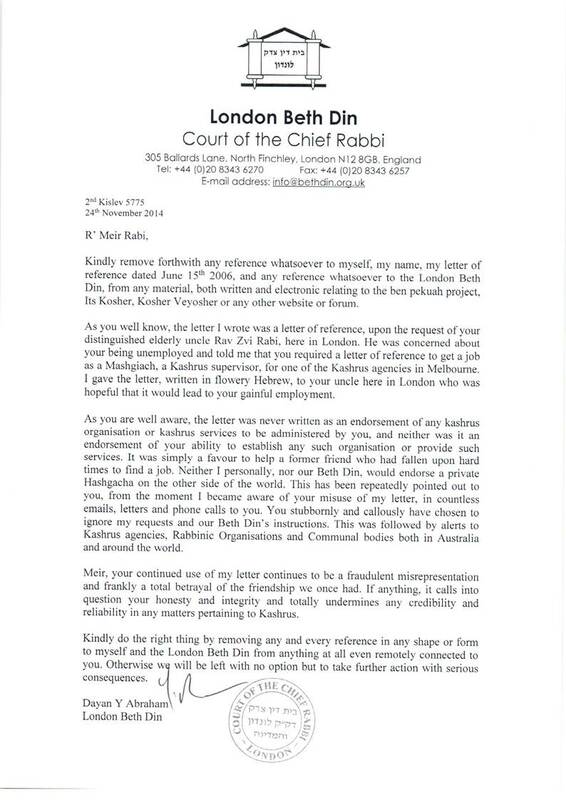 Did the Beis Din who is sitting on this case, give permission to R’ Halpern to apply to the secular courts? Who did?